Scientific Name(s): Gazania krebsiana Less. Native to southern Africa, Gaziana krebsiana is an iconic perennial of Namaqualand, where it is an important constituent of the region’s exemplary wildflower displays. 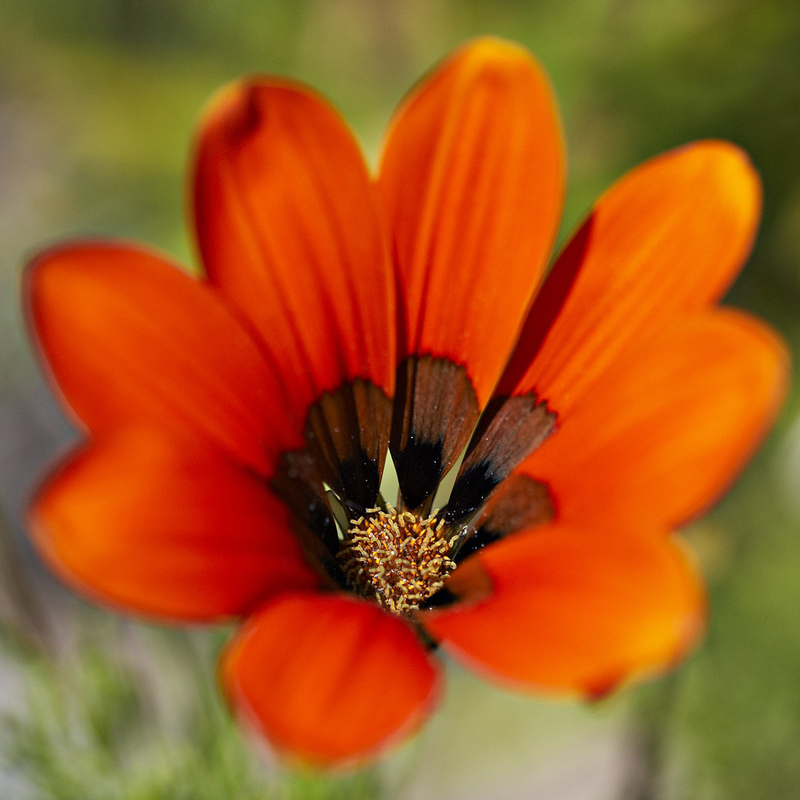 Commonly named in English as terracotta gazania, it is also known as botterblom (butter flower) in Afrikaans. It “owes [this latter] name to the fact that the ray florets are supposed to taste like butter when chewed”, according to the comprehensive species account by the South African National Biodiversity Institute’s Plantzafrica: Gazania krebsiana. After a species-level taxonomic revision by Roessler in 1959, 16 species and ten subspecies were recognized in Gazania. However, a 2009 study, “Globally grown, but poorly known: species limits and biogeography of Gazania Gaertn. (Asteraceae) inferred from chloroplast and nuclear DNA sequence data” by Howis et al. (Taxon 58(3): 871-882) concluded with an assertion that reduced the number of taxa to seven well-defined species and one species complex. This complex is termed the K-R clade, and it includes Gaziana krebsiana (the R being Gazania ringens). A couple hypotheses are put forward regarding the species complex: “The K-R clade may thus comprise incipient or very young species, or perhaps these taxa might be considered merely as locally adapted and occasionally interbreeding ecotypes”. Whatever the resolution to this question, this species complex is an example of how biological reality resists the “tidy boxes” of names and other concepts; though these are useful, it is always worthwhile to remember they are flawed tools. The plant kingdom offers many examples of speciation confusion. While it is quite simple to offer that an Opuntia is a different species when compared to a Quercus but when one looks at species witin a group of Quercus, Betulacea, or Alnus then the distinctions are not so clear. and a limited amount of segregation into separate species. Daniel: Superb photography. Who knew a gazania could be photographed so beautifully, all said I was wow, is it really a gazania?? because what we get in flower-shops of NYC sold a gazania may add color to the living room flower vases, BUT make for ugly flower portraits, never winning any photo competition.